It was 34 years ago today that Eisenhower High School English Teacher Gil Hernandez assigned my English II class to write in a journal three times a week. Less that a year later I almost lost the damn thing. Dad let me take his car to school. It was the Cadillac our family bought years earlier for our vacation to California, but as it got older, it became Dad’s everyday car. (It’s hard to fathom today that a car that guzzled fuel at a rate of 8 miles per gallon could be an “everyday” car.) Michael and I decided to hang out after school, so we got in this 5000-pound rolling house of a car and rumbled off down 53rd Street in the direction of my home. Having to face adversity every day, my share has been dealt for today. A car ran over my journal. Fortunately there were no fatalities. 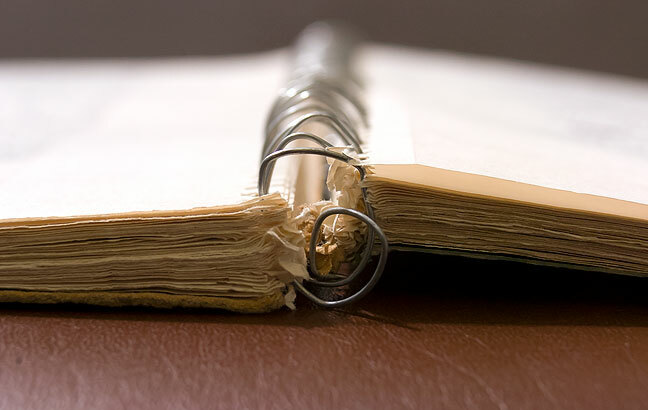 Almost all of the pages survived, but the spiral part of the notebook is hopelessly crushed. Ironically, I only had today and tomorrow to enter and this book would have been full. How, you may be wondering, could my journal possibly be run over by a car? It fell off the roof, of course. As we drove on, something didn’t seem right, and when I looked in the back seat, I didn’t see my journal. It dawned on my that I’d put it on the roof of the Cadillac while I unlocked the door, and left it there. In something of a panic, we turned the boat car around and raced back toward the high school. We spotted the journal sitting forlornly in the middle of the road in the very busy intersection of 53rd and Gore. In my mind I began to formulate some kind of a plan to pull the car up to it when the light turned green and grab it through the open door as we passed it. But before my plan was concrete in my head or the light was close to turning green, Michael was out the door. He dashed like an idiot into traffic and grabbed the journal like a football, then dashed back to the car and got in. Nearly losing the journal wasn’t nearly as embarrassing as many of the things I wrote in it. My entire emotional structure is collapsing. Time lingers on and brings back memories. So much has happened to me since last summer. I remember. I remember all the days and nights of bitter, sad, angry, empty feelings. And I know, now, that absolutely no one cares about me. Right now I sit and write and no one on earth is thinking of me or remembering me. I am just a shadow on a wall. I am nothing. I gotta go back in time and get this guy laid. This is the journal volume as it appears today, with the steel spirals slightly unsquished by several straightening attempts with a needle-nosed pliers. What if the secret meaning to your life was on the destroyed page? Or, there is an interesting musing, to create what was on the destroyed parts. Love the ressurected spiral wire and soft bokeh frame.